Is My Champion Super-Heroically Hot Or Not? Cryptic Studios makes a game out of the vast character customization options in their upcoming superhero MMO Champions Online with the addition of a new "Rate My Champion" section on their website. It's basically "Am I Hot Or Not?" for the superhero set. Characters generated in the beta version of Champions Online appear in the special section of the website, where players can then assign one to five stars to the creations, with the top heroes highlighted on the page. With ratings ranging from "Pretty Neat" to "Super Cool" make it more of a game of "am I awesome or more awesome?" than "am I hot or not? ", the feature does manage to highlight some of the options available in the game at this early stage. 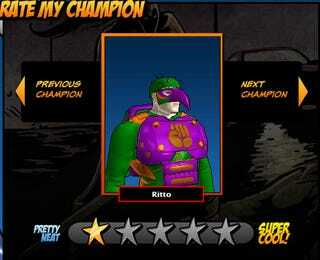 Check Out the New "Rate My Champion" Feature on www.champions-online.com! Los Gatos, Calif. – January 22, 2009 – Cryptic Studios™, a leading developer and publisher of massively multiplayer online role-playing games (MMORPGs), announced a new “Rate My Champion” feature on the Champions Online website which will allow the public to view, and rate, characters created in the Beta version of their upcoming game, Champions Online (www.champions-online.com). Well known for the extensive character creation options in their games, Cryptic Studios is now out-stripping their own prior accomplishments in the area of character customization. "The Champions Online character creator defines the new standard in avatar customization in MMOs," said Randy Mosiondz, Lead Designer for Champions Online. The new “Rate My Champion” feature on the website makes public for the first time the vast array of customization possible in the soon to be released game. Visitors to the website are invited to vote on their favorite Champions using a ranking scale of 1 to 5, with 5 being the highest (www.champions-online.com/rate_my_champion/). Please visit www.champions-online.com today to learn more about exciting new developments in Champions Online!